There will be no general service ringing before Evensong this Sunday (16th September 2018). This is due to a pre-arranged quarter-peal that will be taking place, in place of usual service ringing. The morning service ringing will take place as is usual. On Sunday 9th September, I joined forces with five very kind people who had given up their Sunday afternoon, to form a band to ring a quarter-peal of Reverse Canterbury Pleasure Place Doubles. Once I had located the correct church!…we could be found in the tower of Sturminster Marshall, on mainly medieval bells, with the tenor dating from 1400, weighing in at a healthy 18cwt. Lovely rich bells, and smooth going, steady speed too, due to their moving weights. This was my second attempt at Reverse Canterbury. My first was hampered by inexperience with a long draft, lassoing ropes, and a touch of wheel slip on generally ‘difficult bells’, and in hindsight, was a great lesson in itself, even though we came away without scoring. One of our younger members, Jack Pease, (only 19), was conducting the quarter-peal. The band were very easy going, which leant to a relaxed atmosphere in which to ring, and focus on the 1260 changes ahead. We started off well, and aside for a minor blunder by yours truly in the middle, when I decided to go for a ‘wander’ off the well trod method pathway, we scored the quarter-peal, and I was able to make my mark in the tower records book. All the ringers made a great team, and could sense (probably by my glances of mercy), when I needed a word of encouragement, or affirmation of what piece of work was coming forward next. This is now my fourth quarter-peal since taking up ringing in November 2016, and each one has been a very individual and tailored experience. Some with people I know, and my tutors from Sopley, who are able to foretell mistakes I may not have even begun to career through yet! Some with people I have met for the first time, and by the end, have become team players together, thinking as a unit on, musical, mathematical, and physical/technical levels. As a good friend mentioned to me…it is like giving 88 people a key each from a piano, and going off with an instruction to coordinate a full piece of music. We have a motto at St. Peter’s, where I ring on a weekly basis on their bell-handling course…’The strength of the team is in each individual member, the strength of each member is in the team’. I have received support and guidance from all across our district, and further afield. Attended ringing days out, events, education days, ringing holidays, specially tailored district practice evenings, quarter-peal days and fortnights, district practices, meetings, plus other tower’s practice nights, bell-handling workshops, all their time given on a voluntary level. We are very lucky in our district there is always something going on, with a very busy website, we just have to go ourselves and grab these opportunities. I have been bitten by the bell-ringing bug, and ring about five times weekly now! Quarter peal at Eling commemorating Fred C. Crook, died 1917. We rang this Quarter last Sunday, after a bit or research Ruth Jackson discovered that an Eling Ringer (not a Guild Member) died 101 years ago in WWI. Commemorating the 101st Anniversary of the death of Eling ringer Fred C Crook. Fred Crook joined the Eling band in 1905. He died on 16th July 1917. He was a gunner in the Royal Field Artillery and is commemorated in the Amara War Cemetery in Iraq. In the 1911 census he was living in Jacobs Gutter Lane, Eling, and was a carpenter. The centenary was missed as Eling was not affiliated to the W & P at the time of his death and the details have recently come to light. First QP at first attempt 1&6. Graduation compliment to 1 on attaining her MMus and 6 who has completed his training to become a Montessori teacher. First QP for Ben as conductor. Also a huge thank you to Ross for helping to encourage our youngsters. Congratulations to Sue Walker of the Petersfield band who rang her first Quarter Peal at the first attempt, on one of the hottest days of the year. Sue arranged the quarter herself and invited those she wished to ring with her. Many thanks to all who took part and helped Sue to achieve her aim. Details below. 1st quarter peal – 6. Jake is the first Swanmore taught ringer to ring a quarter peal. 1st 6-bell quarter in the tower and 1st on the treble. Daniel’s First Quarter was scored at Minstead. He is a member of the Eling Band. 1st QP at 1st attempt 6. Rung for Guild of St Agatha quarter peal week. Rung for the Strike Back Against Blood Cancer Cathedrals, Minsters and Abbeys challenge. First Quarter in the method. 1st attempt at calling a QP 4. Get well wishes to June Banning a member of the Sacred Heart Band. 3rd Quarter Peal Attempt of the day scored. St Lawrence Alton prior to service. First in method for David. 3 Quarters Scored 12 ringers, 3 towers, 2 conductors, and 3 firsts……. Good start to Quarter Peal Fortnight………..
Lance Corporal Vincent Street, Christchurch, Winchester Diocesan. Died 26/09/1917 age 30. Machine Gun Corps (Infantry) 215th Coy. Service No.55149. Commemorated at Tyne Cot Memorial, Belgium, Panel 154 to 159 and 163A. Born 4th quarter 1886. Son of Alfred James Street and Christiana Jane Street, of Armadale, Christchurch, Hants. Husband of Dorothy Redler (formerly Street, née Green) of Downs House, Bathpool, Taunton, whom he married in1914. Father of Dorothea J. Street (born 1916). 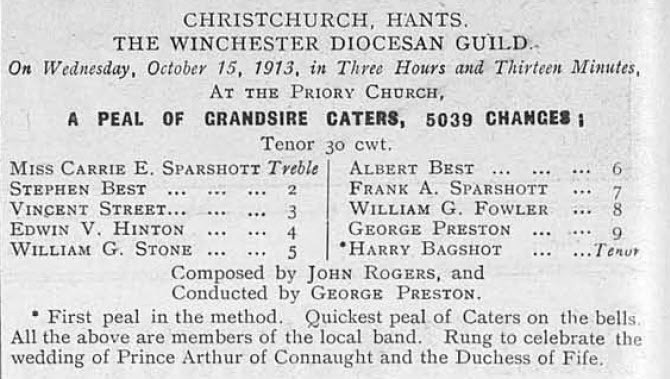 He rang three peals at Christchurch, all of Grandsire Caters: his first on 27/01/1908, ringing the 2nd. He worked as an ironmonger’s assistant before enlisting. Born: Christchurch, Hants. Enlisted: Christchurch, Hants. Resided (1911 Census): 4 Castle Street, Christchurch. Rung to celebrate the 100th anniversary of the dedication of this church. The longest peal in the method subject to ratification by the Records Committee. At the time of writing there have been 5 successful quarters including a First on 8 by Lisa Ashforth, and a “First for nearly 20 years” for Brian Greenwood. On Saturday the 12th of August two young ringers from the Christchurch Priory Band scored their first peal at Corfe Mullen, Dorset, Nicola Penny and Luke Brooke. The peal of plain Bob Minor was conducted by Priory Tower Captain, Tim Martin, his first peal as conductor. We still had some energy left after lunch so we rang a quarter peal of Grandsire Doubles on the significantly heavier six at Sturminster Marshall, ably conducted by Luke with Nicola excelling on the tenor. We were grateful for the support of Simon Edwards from Swindon and to William Stafford from Brighton for substituting at the last hour and scoring only his second Peal. First Peal 1,2. First Peal as Conductor. The band would like to associate Colin Butler with this peal with our best wishes for a speedy recovery. Rung for evensong in memory of three Alresford men who died during WWI in July 1917: Lance Corporal Charles Eacher who died on July 8th 1917; Company Quarter Master Sergeant Alfred Woodward who died of heatstroke at Baghdad on July 15th 1917; Lance Corporal Charles Edward Gordon Grainger who died on July 31st 1917 at Passchendaele. There were 219 peals rung for the Guild during 2016, which is a slight fall compared to 2015; however this total is still significantly higher than any year other than 2015 since the early 1980’s. I said in my report last year that I hoped the Guild would maintain its peal ringing activity and I am pleased to say that we have achieved that. Keep it going! I must thank Andrew Craddock for sharing the statistics generated by PealBase, allowing me to cross-check the Guild’s records. Finally I would like to thank all those conductors and organisers who submit details, compositions and fees within the one month deadline specified by the Guild rules. Please may I also remind conductors that we do require all compositions in full whether or not they have been rung for the Guild previously. I am also pleased to announce that I can now take peal fees electronically; I would request that conductors email me FIRST for a reference and the necessary account details, even if you already have them, to allow me to monitor what I have and have not received. There were 142 tower bell peals rung for the Guild in 2016, 14 fewer than the previous year but comparable to 2014. What is of greater concern is the number of ringers taking part in a tower bell peal continued the decreasing trend witha fall to 200, this is 24 fewer than 2016 and 46 fewer than 2013. Six ringers rang their first peal in a W&P peal during 2016 and the Guild Officers would like to extend their congratulations to Will Stoddart, Martin Willson, Helen Rolf, Janice Firth, Rob Gorton and Gemma Loweth. The latter three actually achieved their first peal in a handbell peal but are included here for completeness. To add to this list Aileen Wilson also scored her first tower bell peal. Following the ‘First Peal 2015’ initiative it is good to see that the Guild is still introducing ringers to peal ringing and I would encourage all members to think whether you or somebody else in your tower would be interested in attempting a peal. It would be brilliant if we can increase both the numbers of new peal ringers and ringers taking part in peals in general to stem the falling trend. Malcolm Powell heads the list of prolific peal ringers for 2016 pushing last year’s leader, Edd Colliss, into second. John Dodd and Kathryne Arkless also remain near the top with Gareth Higgs, Jim Twiney and Graham Nobbs joining the list of people to ring 40 or more peals for the Guild in 2016. The list of prolific conductors remains largely unchanged with Edd Colliss still heading the list with Toby Arkless and Ben Carey exchanging places behind. Once again, like the total number of ringers the total number of conductors is also down 3 on 2015 to 29. St Agatha, Portsmouth heads the list of the leading towers again with a similar number to 2015 representing over a third of the Guild’s 2016 total. It is also worth noting that no other tower rang more than 9 peals, the first time this has happened for 9 years. The first peal on the augmented ring at All Saints Basingstoke was completed with a peal of Bristol Surprise Royal in April. There were a number of personal footnotes during 2016 and I congratulate Paul Young on his 1200th, Martin Daniels 500th, Graham Nobbs 400th, David Mattingley 300th, Colin Butler 250th and Kieran Downer 25th. Toby Arkless and Edd Colliss scored their 250th as Conductor. Several ringers also reached a milestone for the Guild; Malcolm Powell and Jim Hodkin 500, and Andrew Howes 100. Roy LeMarechal passed two significant milestones during 2016, ringing his 2000th peal for the Guild with a peal of Cambridge Royal at Bishopstoke in February and his 3000th peal some three weeks later, also Cambridge Royal at Bishopstoke. Roy is only the 49th person to achieve this total. Peals were rung by the Sunday service band of Vale, Guernsey, who rang a peal of 7 Doubles in January, and Bishopstoke, who rang a peal of Double Norwich in December. I would also like to mention the 7 members of the Catherington Sunday service band who scored a peal of 13 Spliced Surprise Major in January and it was my pleasure to ring the treble for you. In February a peal of Yorkshire Surprise Maximus was rung at Hursley by a ladies band; this is believed to be the first twelve bell peal rung by a ladies band for the W&P. Peals were rung in memory of Guild Member and former A&P district Chairman Andrew Barnsdale. Several peals were rung to celebrate the 90th Birthday (both actual and official) of HM Queen Elizabeth II. Peals were also rung on the 100th anniversary of the Battle of Jutland and as part of the Bell Ringers Strike Back Against Blood Cancer campaign. The strength of handbell ringing within the Guild continues with a slight increase on the 2015 total to 77, again a new record as far as I can ascertain. The numbers of ringers and conductors participating in a Guild handbell peal remained broadly similar to 2015, both being only one fewer in 2016. Ian Redway and Frank Morton were once again the leading ringer and conductor of Guild handbell peals. Whilst the lists of prolific ringers and conductors look very similar to previous years one name appears much higher than before with Duncan Loweth conducting 14 handbell peals for the guild. In August John Croft scored his 1000th peal in hand and also reached his 200th peal as conductor in a handbell peal. John Dodd rang his 1000th peal for Guild in a handbell peal in May. Martin Daniels and Trish Spink achieved their 250th and 50th peals in hand respectively.